Operation HOPE (Homeless Outreach Providing Encouragement) is a year round Homeless Shelter serving families with children and single women experiencing homelessness. We provide our clients with wrap-around case management services in order to efficiently and effectively guide them in recovering a self-sufficient life. Volunteers work with our staff and clients to help support our ongoing programming of adult life-skills classes, After-School tutoring, Children's Activities, Client Boutique and Hot Meals, as well as offering administrative support to a small non-profit organization. 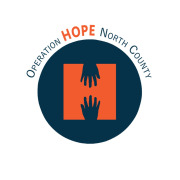 Would you recommend Operation HOPE-North County?